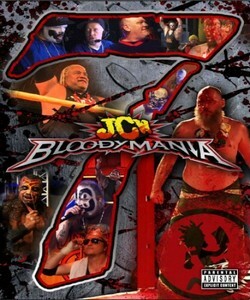 Bloodymania 7 took place at The Gathering of the Juggalos 2013 and anyone who was present for this blood, guts, and destruction knows that it was an event to remember that will forever be burned into their memory banks! Also included is hilarious and highly knowledgeable commentary by Shaggy 2 Dope and Kevin “KG” Gill! Ring announcing from Legz Diamond and Upchuck The Clown! Your JCW Commissioner with a hatchet Violent J! And DJ Clay spinnin’ on the ones and twos!